Heel Fissures, sometimes called cracked heels, have the appearance and feel of tree bark. This can be cause for embarrassment and discomfort. However, there are many effective solutions to solve this problem, as well as several methods to prevent it. Think of looking at a freeway map and how it is filled with chaotic lines. Heels affected by fissures often appear the same: routes and roads carved into the bottom of the foot. They are dry and rough in texture. As they deepen, these ravines can leave your feet exposed to bacteria and fungus, which often lead to infection. In fact, in some cases heel fissures can end up causing a mean case of athlete's foot. Everyone is capable of getting heel fissures, but some are more likely than others. Genetics is one thing that can play a part. Your propensity for fissures might be attributed to inherited thin, dry skin. If you are anemic or lacking in certain vitamins like zinc, you are also more susceptible. Obesity is yet another contributor. Other medical causes include diabetes and hormonal issues, like thyroid disease or an estrogen imbalance. Additionally, deficiencies in the circulatory system may also be at the root of the problem. Skin diseases like psoriasis and eczema can leave the feet prone to dryness as well. However, there are reasons outside of medical conditions that can cause you to become afflicted with heel fissures. For one, jobs or activities that require long periods of standing, especially on hard surfaces like wood or cement. Rough floors such as these lack support and cushioning for your heels. Improper footwear can cause your feet to be exposed. Sandals, flip-flops and open-backed shoes leave your heels hanging. The wear-and-tear of everyday walking is worsened when your feet are not aptly protected. A long, hot summer also endangers your feet. The arid air dries the skin’s natural moisturizing barriers, leaving it rough like sandpaper and prone to problems. Exposure to bacteria and fungus leads to further complications. Locker rooms, gyms, swimming pools and even showers are hubs for unfriendly infections that can cause your heels damage. 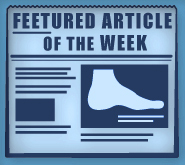 To prevent heel fissures from developing, the right footwear is key. Wear socks and shoes when outdoors, and only don sneakers that fit correctly. Save your sandals for the beach and pool, and always be sure to wear them in locker rooms and public showers. This will help protect you from invisible causes of infection that lurk on the floors. If you have chronically dry skin, keep your feet moisturized. Make it a routine to rub them with a lotion containing aloe or other ingredients that promote healthy skin. Do this at night when you go to bed, and in the mornings after you shower. This will make helping your heels feel like second nature instead of a chore. Heel Fissures can be persistent, so if at-home treatments like foot-baths, lotions, and pumice stones aren’t quite cutting it, consider consulting a professional to help you out. Dr. Michael Stein and Zeindelin Ahmad, DPM, can offer assistance and guidance to help you get your fissures gone for good! Visit us at Foot Doctor of the East Bay for more information. You can find us in San Leandro, Pleasanton, and Los Gatos CA.